As I traveled around Japan for 10 days after finishing my EAPSI fellowship, I spent a lot of time on trains. By my count I logged about 2200 km by rail in the span of a couple days, and my lasting impression of Japan’s rail network is clear- I can’t praise it highly enough. I used the shinkensen bullet train a lot while travelling around, and it continued to reinforce the idea that trains are vastly underrated. As far as I can tell, there are only two drawbacks to trains relative to planes- first, you can’t change the route after you build the tracks, unlike planes that can go between any two locations as long as they both have a runway. Second, the bullet trains have a max speed of 285 km/h, which is obviously a lot slower than planes (around 700 mph). With respect the first drawback, all the most heavily trafficked plane routes have been continuously flown for decades, so its not like there’s a serious risk after you build rail lines between two major cities that you will later discover no one needs to travel between those places anymore. I’m looking at you, California. Seriously, it’t not exactly a daring prediction that people are going to keep needing to travel between Los Angeles and San Francisco for the foreseeable future. For the second drawback- the fact planes are much faster- that’s easily offset by all the other benefits trains have. I feel like I’m stating the obvious here, but considering that we don’t have enough popular support for rail travel in America to, you know, actually build train lines, maybe it isn’t obvious enough yet. The incredibly obvious observation I’d like to share is that aside from the time the plane is in the air, plane travel is incredibly slow. Airports are rarely in the middle of a city because they require tons of space and make lots of noise, which means you need to spend more time getting to and from airports than it takes to get to a well placed train station. There’s a ton of time spent on security checks too, but trains are less of a target for terrorism. While they can be bombed (a weakness shared by pretty much everything except for bodies of water), they can’t be hijacked and flown into things. Consequently, taking the train in Japan featured as much security checking as taking a subway, which is to say, none. Loading and unloading planes also takes a long time. This is a natural result of the fact that air travel has razor thin profit margins, requiring planes to be tightly packed, with typically one entrance on most aircraft. Meanwhile trains have two entrances per car. They’re also not loaded or unloaded completely at most stops, and its safe to stand near the doors while the train is arriving and departing. On top of that, without the pressure of small profit margins, trains can make a greater number of trips per day, and don’t need to be filled to capacity. So while passengers on planes must arrive 90 minutes early to protect against the nightmare of missing a flight, with trains the consequences are much less dire. This means less cushion time, which reduces travel time relative to flight even further. 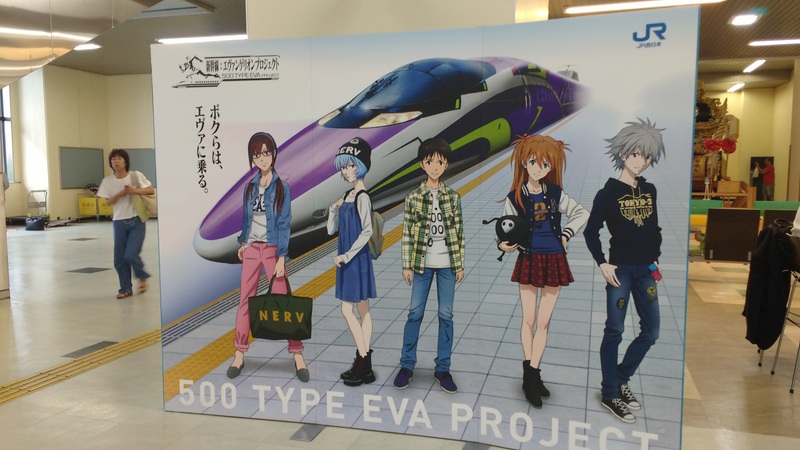 Japan has a train inspired by the anime Neon Genesis Evangelion. It’s basically the train equivalent of cosplay. When I was at Georgia Tech, the project I worked on was part of a large NASA program to address long term goals for passenger transport aircraft. The whole thing was motivated by the fact that air travel is predicted to not just stick around, but to keep growing over the coming decades. That means the cost associated with travelling, the inconvenience, and the substantial carbon footprint are just going to get worse. Interesting, it was found that in order to reach goals for emissions reductions, there was no way around the fact that planes will have to fly slower, since the faster you fly, the less efficient you are. This reduction in speed was expected to be offset in time savings everywhere else. But all of those problems I listed are direct results of things that are inherent to air travel, and they can’t be fixed easily. Airlines aren’t trying to make everyone miserable- if fixing those problems was easy they would have done it by now. How do they plan to address the fact that you can’t move airports to more convenient locations? How can you make boarding faster when after 100 years of optimizing we can only reduce the cost of flying so much, necessitating that planes be tightly packed and fully booked? I think it’s mind blowing that it’s possible to achieve these goals with current technology- plenty of other nations already have. And this doesn’t even mention aviation’s carbon footprint. While battery technology is improving rapidly, development is focused on reducing costs to be competitive with fossil fuel engines. No one has high hopes that we can do anything about the fact that hydrocarbons have fantastic energy density. While a lower energy density isn’t a problem for cars, with planes it’s a dealbreaker. They need to save every pound they can, and carrying batteries that weigh more than fuel does, and which do not get lighter throughout the flight (like a fuel tank does) means that planes will continue to depend on fossil fuels for the foreseeable future. We can reduce drag with better aerodynamics, reduce weight with composites, reduce fuel burn with slower cruising speeds, and increase engine efficiency with higher bypass ratios, but those can only do so much. Not only is aviation’s fraction of our total carbon footprint expected to go up because of more air travel, its also going to go up because electric vehicles are expected to make the rest of the transportation industry go down. So considering that a sober assessment of the future of air travel already begins with an acknowledgement that planes will have to fly slower, and that there’s no way that planes can be powered by batteries, why can’t we as a society recognize that there’s a form of ground transport that’s already able to replace a lot of our aviation industry, if we would only invest in it? I’m not suggesting trains can or should replace planes completely. Obviously for longer distances planes enable faster overall transit time than trains, even with the steps in the airport moving at a crawl. But for travel between nearby cities, we really should recognize that trains could be the miracle we’re looking for. I’m aware there are reasons that this hasn’t happened already, and its a lot easier said than done. But this is just a blog post about why we should do it, not how.